The FMG series of rotary gas meters are designed to meet the highest demands of reliable and accurate measurement of gas flow. The meters are MID approved and fully comply with EN12480 and OIML R137. The compact exchangeable aluminium cartridge allows local repair and on-site cleaning. The robust design of the casing and the cartridge make the meter less sensitive to installation stresses caused by the connecting piping. 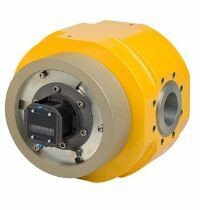 A significant amount of misalignment of the connecting piping/flanges can be tolerated by the meter without affecting the meter performance by jamming the impellers. The FMG rotary gas meter is a displacement type gas meter. The meters are designed for fiscal use (MID approved by the NMi). The aluminium casing of the FMR (body and front plate) is designed for working pressures up to 40 barg with a safety factor of 4. The square impellers and the improved position of the main bearings and shafts, make the meter less sensitive to overload and pressure shocks. The high pressure rotary gas meter series are designed to meet the highest demands of reliable and accurate measurement of gas flow. 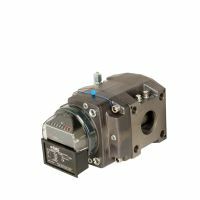 The high pressure meters are designed for working pressures up to 100 barg and for fiscal use (MID approved and fully comply with EN12480 and OIML R137 by the NMi). Since the installation of the meter contains a special designed bracket, the exchangeable aluminium cartridge allows local repair and on-site cleaning which is unique for high pressure meters.